Budapest admits Hungary's role in the Holocaust during ceremony marking 70th anniversary of camp's liberation. 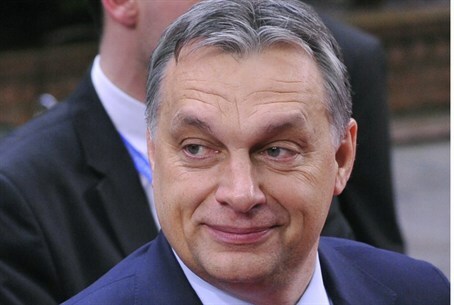 Many Hungarians chose "bad instead of good" in helping deport Jews to Nazi death camps, Prime Minister Viktor Orban said Monday in his first acknowledgement of his country's complicity in the Holocaust. "We were without love and indifferent, when we should have helped, and very many Hungarians chose bad instead of good, the shameful instead of the honorable," Orban said at a memorial in a Jewish cemetery in Budapest on the 70th anniversary of the liberation of the Auschwitz camp, according to AFP. The Holocaust was a "national tragedy for Hungary and irredeemable loss for the Jewish community," he said. Some 600,000 Hungarian Jews perished during the Holocaust, most deported with the aid of local gendarmerie to Auschwitz after Germany occupied Hungary in March 1944. Unlike Hungary's president Janos Ader, Orban had not explicitly acknowledged Hungarians' role in the deportations before Monday. During events to mark the 70th anniversary of the Holocaust last year his government was accused by Jewish organizations of "whitewashing history." The government sparked particular anger by commissioning a statue that honors "all victims of the German occupation of Hungary", and which shows an eagle attacking the Archangel Gabriel, a Hungarian symbol. Orban denied it was a Holocaust monument. The head of the main Jewish group Mazsihisz, Andras Heisler, however called Orban's presence at the service Monday an "important demonstration" that "Jews have been part of the Hungarian nation for centuries".